November 6, 2013, 2:36 PM · Disney's Tony Baxter was the lead designer on many of the theme park industry's most beloved attractions, including Splash Mountain, Star Tours, and the Indiana Jones Adventure. Earlier this year, Disney honored Baxter as one of the company's Disney Legends, and last week, the company unveiled a window tribute to Baxter on Disneyland's Main Street USA. 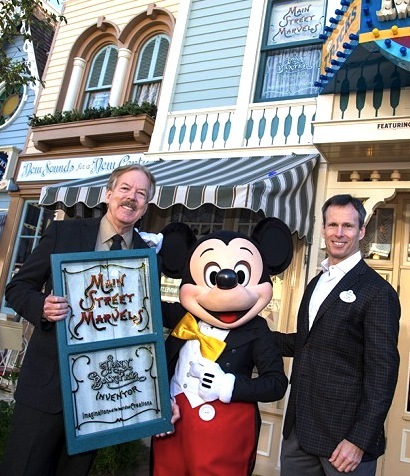 Tony Baxter, with his window, Mickey Mouse, and Disney Parks chairman Tom Staggs. Photo courtesy Disney. Last month, Baxter invited me to his office at Walt Disney Imagineering in Glendale, California for a conversation about his career, how his many projects came to be, and the current state of attraction design. We will present the interview in three parts, starting today and continuing for the next two weeks. Did you know that Star Tours was first designed as a roller coaster, where Yoda would use The Force to launch your coaster train? Or why it's so cold when you board the Jeeps on the Indiana Jones Adventure? Read on to learn more…. Robert: How, and perhaps more important, why did you get into this business? Tony: I don't think it was one exact thing. It was encouragement that began in sixth grade, when I was probably a year younger than most of the kids in my class, so I was always competing in a negative way, physically. But I had a teacher who went out of his way to compliment me on art work and put me in charge of design for the boards, and everything. And I think that was a way of finding my place that up until then was tentative. I probably should have been held back a year (laughs), because I started kindergarten at four. It's funny, because when I go back to reunions now, I'm taller than most of the football players that I looked up to and was intimidated by. I think that pushed me into the art area, and as Disneyland came along, it became more and more from just a fun place to go as a kid to something that I dreamed about working at. I thought that it could pay for my college, and at the same time I would be working at Disneyland, getting to go there for free. So that was the first goal, but I didn't realize at the time that 17-year-olds are limited to very few choices there, which basically amount to food and sweeping or whatnot. So I took the job, not because it was scooping ice cream that was important. It was scooping ice cream at Disneyland that was important. As soon as I could, I transferred over to operations, and now the dream was to get into a fabulously thematic attraction, like Pirates or Haunted Mansion, instead of being on Autopia (laughs). I managed to get into a couple of those: Adventure Through Inner Space, that was a really fun ride to work. As I completed my college during that time, then I thought, what the heck? I had done a portfolio piece that I'd shown around to friends and supervisors at Disneyland, and they encouraged me to take it up, and I did. I got kind of a mid-course correction to take more art classes and I actually changed schools from architecture at Cal Poly to theater design at Long Beach. And that worked really well. I did my final project aimed specifically at Disney — I was really rolling the dice, because if I hadn't gotten [the job], it wouldn't have been of much value anywhere else. But I did get in here, and I hired into what at the time was called the Model Shop — it's now the Dimensional Design department. And I've been here ever since. I started at Disneyland in 1965, so I was there for a year and a half with Walt. Not in any relationship, which is a sad thing, because I think all the stuff I've done since then would have been in partnership or he would have been there — I can't even imagine what that would have been like. But I did see him around the park, and was very impressed with his involvement in the nuances of Disneyland, coming around to my little ice cream window and whatever. I thought, 'man, he's got Florida started and he's got the New York World's Fair just wrapping, and he's got Mary Poppins, his biggest film, and Jungle Book is under his work,' so it was pretty amazing thing to see someone like that. But his interests were in Disneyland. People who see it as a business don't understand that, for Walt, it was his pride and joy. It was his toy, his center of the universe. Going there every weekend wasn't like punishment, it was like he could hardly wait for it to be Friday night, so he could he could go down and spend the weekend in the apartment, and drive the Carnation truck around Main Street, and stuff like that. In all the people I've worked with over the years who had a one-on-one relationship with Walt, I think if they thought like that, if they shared that wonder and mystique [for Disneyland] that Walt enjoyed, then they had a great relationship with him. Then I've talked with other people who were intimidated and frightened and who talked about hearing the cough coming down the hall with panic and fear, knowing that Walt was about to descend on them, and I think that's because they didn't enjoy the same sense of involvement with the Disney things. They were great and accomplished artists, but with their own interests. They were always wondering if they were in synch with Walt. But people like Claude Coats and Marc Davis, they didn't have that problem. They knew that they could just dialogue and the ideas would build. When I landed here at Imagineering, it sort of centered around Claude. I think the difference between Claude Coats and Marc Davis was that Claude was very open to absorbing ideas and building upon concepts with the input of the people he worked with. Marc was more knowledgeable about what he wanted to do himself: 'I will use people here to help make this idea reality.' But there wasn't much room with Marc to be a contributor, other than finishing or forwarding his concept. Now, looking back at it, I think the healthy thing that I enjoyed in my second generation of Imagineers is that the first generation, the guys who worked with Walt, were old enough that they weren't threatened by us 20-year-old upstarts. They're in their 60s, early 70s, and we were in our 20s. It was really, to them, 'how much can we move them along before we end up dropping out?' From my end, there was no 'why don't you guys leave so we can take over?' I was scared to death, as were all of us, of what happens when they're not here anymore? What I think you see today in most industries is there's a fear of letting those big gaps develop, but I think they're healthy. When you've got 70s, 60s, 50s, 40s — they're all fighting one another for the limited amount of spotlight. So, therefore, there isn't that camaraderie, or this transfer of knowledge, or this partnering. Mentoring is sort of false term when it's applied in the sense of a young person comes to you and you give them advice. Mentoring is where the two of you work together on something. And you benefit from new ways of thinking, getting you infused in the idea, and the transfer of knowledge of what works and what doesn't work, from years of experience. That combination makes incredible progress. I think when there's a little close-chestedness — 'I'm not going to share my idea because I might lose it' — that becomes hard to overcome when you're all fighting for the same growth. So I think I was very lucky to be a part of the generation that benefitted from that. There were so many programs here for learning — Marc would come in and teach us, or Sam McKim or X Atencio — all these people who were legends. I just wish that we had video equipment back in that time. There's about two hours, that's all that exists from [then]. I think we have Harper Goff and a little bit of Davis. That's it. But what a wonderful opportunity and time to get started. Robert: Your generation didn't get to start with a blank slate. Disneyland was built. The New York fair has happened. You've already got an existing infrastructure in place. There's this existing narrative that is Disneyland that you have to work with now. Not only that, the public has some expectations now. It's not 1955 anymore, when they didn't know what to expect. People have expectations about a Disney theme park, and they're rising. How did you and your generation adapt to this change in what it meant to be a Disney Imagineer? You're not just building it from scratch anymore. You're care-taking what's already there, then trying to take it to another level, which can be a different task. Tony: It's got advantages and disadvantages. The advantage is that there is a layout, and the Disneyland layout is the finest one we've ever done. Everything else has been trying to work around it and avoid the cliche of using it again, so you've got a lake in Epcot, you've got kind of a randomness about the Studio Tour, and maybe even Animal Kingdom, that I don't think is as clear to the public. When you walk into a world of fantasy versus adventure or tomorrow, it's strikingly clear. And it was indoctrinated into people on television, with the Disneyland TV show. I have values about Disneyland, Florida, and Europe that I try to impose if we, say, were to do one design that was to go into all of them. It would be that Disneyland is charming, Florida is spectacular, and Paris is beautiful. In that way, if you were doing a concept like Thunder, you would tweak it a little bit to reflect that, otherwise one of things I fear is people saying 'it feels like a scar.' The best praise I get is when I overhear a guest say 'oh my gosh, it looks like this was always here.' It's almost like reassurance to them that we haven't wrecked it, that's there's not going to be this horrible slice where it doesn't look like it belongs there. So every time you can, replace something with something that's, hopefully, better, but in no way looks like it damages or isn't consistent with the palette that Walt Disney laid out. I think, for me, all of that's a positive thing. The aspects that became difficult would be difficult whether you were working off of a draft that already was there, like Disneyland, or being part of creating a draft like Epcot where all he left us was that you're going to live a life you couldn't live anywhere else (laughs), and that everyone on the planet wanted to move there because the model at Disneyland in the General Electric building showed this city that looked like out of The Wizard of Oz or something. I was convinced that I was going to move to Florida [to work on Epcot] until I got a sense of the summer humidity there (laughs). You'd have to live indoors to survive. Really, when you get down to it, that was a blank sheet of paper for Epcot. Yet there was the chance to continue to add to Disneyland, where working within a footprint was a challenge, but, I think, an easy one. The tough one was, as you said, not only was the audience expecting more, but our competing media, like film and television, were becoming more sophisticated, too. If you could see it in a film, you expected to see it in a theme park. That was maybe conceivable when your competitor was doing puppet animation and whatnot, like Star Wars, the first one. But once we moved into the world of CG [computer generated imagery], creating worlds like that [in a theme park] is darned near impossible. Then you start to say, what avenues do we do better, and try to avoid direct competition where we're going to be short in. Ultimately, putting guests in the middle of a real thing is going to be stronger than sitting in a chair eating popcorn while watching a flat screen or a 3D screen. That became the issue. And you were in danger in the 1970s, that you had a park that was perfectly in tune with the 1950s and 60s generation — the Baby Boomers — but absolutely had no value for kids who came of age during Star Wars and ET and Indiana Jones. So we got into that situation where, for whatever reason, I drew that straw and got to go over and talk with management about for the first time ever getting outside the comfort zone of Disney-generated IP. We had combed the archives and had settled on Song of the South as the one remaining traditional Disney thing that had theme park qualities, because it went to incredible places, it had great characters, and it had great music. There were a lot of other films but, like, Cinderella doesn't lend itself to going through place, because you've basically got a castle and a cottage. You need to find these rich environments that not only are intriguing to go into but also reflect places that Disneyland supports. So Splash [Mountain] had so many things going for it, in that it could be part of the south, where we start with New Orleans [Square] and kind of progress out to the plantations and there's the backwood quality of Critter Country/Bear Country, and so that, and the music, and the characters, that was brewing in my head. But I knew we were going back to a previous generation. It was a film that, for a lot of reasons, isn't shown, so you'd have no ability to reflect on a modern audience with it. So it had to stand on: Is it fun to go in on it? Is the music fun to listen to? Are the characters engaging? George was very gracious. He said, egotistically but rightly so, that his product was A+, and so was Disney, and if he couldn't do it himself, the only place he'd be confident seeing his products would be at Disneyland. So that's where we left. Unfortunately, the next six months were chaotic here at Disney. There was corporate raiding going on, and we thought that the company was going to be disbanded. Out of all that came the reorganization that led to Michael Eisner and Frank Wells. The things that I had been fighting to push forward — because it was fearful to make such a radical change, signaling that The Black Hole didn't quite work, or Tron didn't quite work, or whatever, and therefore we had to go somewhere else — that was hard to fathom. But when you brought in Frank and Michael, it was the normal way Hollywood was running then. The fact that Walt Disney hadn't made a movie since 1966 was a reality to them, and therefore there were new people who made movies, and they brought them in and the company turned around. It was natural. Michael had worked on Raiders of the Lost Ark with Paramount, so the connections were there, and we were off and running with both Star Wars and Indiana Jones. When you talk about "no template," I think that's where we began — the thing I wrestled with was that I've got one group of people that's ready to strangle me for taking us outside of the Disney universe, and the other thing that I know that those people desperately don't want to realize is that their generation is not the generation that's in need of Disneyland being relevant. It is still relevant to them — we still have Peter Pan that they grew up with, and Sleeping Beauty Castle, which they grew up with, and Swiss Family Robinson, which they grew up with. But we have nothing for the people who are they age that they were when Disneyland was created. I knew that once it opened, it had to be good enough and broad enough in its appeal that I would win them over when they rode it. So the people who said, 'how dare they tear out Adventure Through Inner Space' were going to come back and say 'well, you know, I've been on the new Star Wars thing, and it's really pretty good after all.' I think Michael understood that. He was a brilliant marketeer. I remember that when we talked about if we should have six cabs or four at Disneyland because the space there is so limited — it would have been very, very hard to add two more, he says, 'no, let's open with four. It'll be the first Star Wars, the only one for a while, and I think the idea of a line going all the way out the park and people lined up on Harbor Blvd. is good.' It really says that Disneyland has changed — it's reinventing itself and I've got to see this change. So we did open that way, and that did happen and they were panicked, so they left Disneyland open for three days (laughs), which was pretty cool and everybody was happy. We let the press interview at the exit of the ride and after waiting five hours or whatever it was, and it was incredibly positive. Robert: But Star Tours wasn't popular just because it was that IP, which was powerful and relevant and remains so to this day, but that it was a radically different ride system. And for both Star Tours and Indiana Jones. These weren't Omnimovers anymore. How did you find those ride systems and how did you decide that, okay, this could work in a theme park environment? Tony: Well, Star Wars was the first, and the most important one, IP-wise. I remember the jubilant ride back on that plane, thinking, my life is going to change forever, after meeting George. Then we sort of looked around and went, now how are we going to do this? We already had Space Mountain. That's up and running. It's dark. It's outer space. Guests are really good at finishing the suspension of disbelief. They know that's a wall there, and they're in a building that's shaped like a pyramid. Yet they want to buy into that. With Star Wars, you've got that authenticity and it's got to feel like that galaxy far, far away and limitless. We started with a roller coaster and we had some great bits where just before you launch we had a room where Yoda was there and looking at our car and saying 'oh, The Force is really strong with this group.' And then he's going this lift-up motion. And what we did, we took the whole room on Dagobah and it started sinking down into the bog. Well the track was just flat and darkened out, so it felt like the car was lifting up, and when it got to this opening in the trees, it accelerated forward out of there. We thought that was great. And then the main gist of the ride was that there were two or three decisions where you had to figure out which way The Force wanted you to go. Of course, that meant dual tracks and twice as much room and bigger boxes and by the time we were done, we had like a five-acre building. A friend of mine who worked here, Randy Bright, was head of all the films at Epcot, and he came back from some filming, and he said, 'we were in London and we went out to this site where they train pilots, and you really ought to see this thing.' So we went to England. I took Dramamine; I was so worried I was going to get sick on [the flight simulator]. It took us about 25 minutes to get up ladders and get into this cockpit and get all strapped in. And they ran a couple of simulations, but those are basically smooth. The pilots are there to train how to fly smooth. Then they did a roller coaster, but we learned as we got into this that you cannot make a film then try to make the machine track it. You've got to learn what the machine can do then develop a piece of media that fits what the machine can do. Otherwise, you run out of energy. You're still barreling down the thing and we've hit the bottom of the cylinders and your brain is getting a conflict between the feelings your body is experiencing and what your eyes are seeing. That's where the poorer versions of these would make people sick. So we put a tremendous amount of effort after settling on this in creating what we called our bible of what kind of move can follow what kind of movement. One of my favorite examples was when we were completely exhausted midway through the first Star Wars ride, and we needed about 10 seconds to get all the cylinders packed with oil again, we created that scene where you're pulled toward the destroyer by a tractor beam. 'Uh, oh, we're caught in a tractor beam!' and then you're hit with Darth Vader's theme, and all we could do was tilt back a little bit, which pushed you back in your seat and gave you the sense that you were being magnetically pulled. I thought it was one of the better pieces in the whole show and it was one of those things that was because you had to do this certain thing [reset the hydraulic cylinders]. Now, if you ignored that and made a great film, and got to that point when you have to recharge, you'd be left where something happening on the film and the only thing you could do [physically] would be to sit there. What I was aware of was that we could keep the same limitless universe that you were used to in film. Film uses music and it uses lighting and special effects and everything to help tell a story while everyone's screaming and yelling. But in a ride, you have this problem that people would be doing whatever they want to be doing. They're not as focused as they are in a movie theater or at a play. So how do we add something really powerful that tells a story without intruding on dialogue, which becomes pedestrian. After you've ridden something 30 times, the dialogue can be really obnoxious if it's too prominent, too important. Then you go 'yada, yada, yada,' and you hear people doing a sad parody. I thought, here's the trick that really is new in this, and that is you're going to feel the story. And when the pilot Rex said, 'I've always wanted to do this' and we head down into the trench [on the Death Star], in the theater eating your popcorn, you think, 'wow that would be cool,' and now for the first time, you felt the bank and then you felt that leveling out and then the pillowing as you went through, and diving up out after — I think that, really, to me, the story now was not just a visual thing, not a sound impact thing, but it was a physical thing. That moves it out of the theater and into theme park technology. Of course, the delight in that was stored because it was going to be the generator for doing Indiana Jones, which was to free us from the movie screen that we had in Star Wars. The nice thing about Indy's world is it is a contained world. It's a world in which the most exciting parts exist in boxes, whether they're in a temple, or they're in a shrine, or under a catacomb, or wherever it is. They're very tight, theme park-y boxes that are darkly lit and everything. It's an ideal habitat, if the process of using motion as a storytelling device, using physical cues, can be put on a portable device. That was no easy task, since cooling the hydraulic fluid is one of the big challenges. That isn't such a thing in the military application, because if you're trying to keep the ship still, and keep it level with all these adverse conditions — and a good pilot does that — then the exercise of the hydraulic fluid is minimal, so that overheating of it is nil. But in a theme park situation, which is completely doing every chaotic move that you can do, you're literally thrusting the oil in and out, in and out, in and out, and with every action there's a reaction, which here is heat. And so the biggest challenge for Disney was to figure out a way to cool that fluid, which we do easily in Star Wars because it could be taken out of the system and put through chillers and brought back in. Not so on Indiana Jones. We had to develop a way, while they're in the station, of lining up the cars perfectly with inputs that are freezing the oil while you're boarding, because that's the only time we can connect it. That's why it's a little chilly when you board. I don't think anyone notices because you're kind of heating up with anticipation. Next week: We'll continue our conversation with Tony Baxter in Part Two of our interview with the Disney Legend. November 6, 2013 at 4:06 PM · A real WOW interview. Between James Rao's excellent articles & the recent stories by editor Robert Niles, TPI has really elevated it's presence. It was always a good site but it's now probably the best theme park read on the net. November 6, 2013 at 7:08 PM · Wow, this might be my favorite thing I have ever read on this site. Can't wait for the next part. November 6, 2013 at 8:40 PM · ^^^Agreed! This is fantastic, and I realize just how much I miss longer-form writing and interviews when I'm reading blogs. This is so engaging! Is Mr. Baxter going to discuss EPCOT more in a future installment? Thank you for making my evening! November 7, 2013 at 2:31 AM · I can't believe you are making us wait a week for the next part of this interview!!! Wow! is right! tony baxter seems like a man with a lot to say and the best part? we are hanging on every word and when he is finished answering a question...I want to wait to see what more he will add to fill the silence! This is a great interview...you ask a question and let him answer until he is tired! LOL --- If ever there was a man (besdies Walt or Roy) that I wish I could sit and have dinner (or a beer) with -- Tony Baxter is him! Next time I get to visist Disneyland...I will be making a special point to find his window and take a picture! Thanks for the great story so far. November 7, 2013 at 8:52 AM · I really enjoyed reading the interview with Tony Baxter. Your questions brought out a lot of interesting details-- I listened to a recent interview with him on a different website, and although much of what was covered was similar, the questions about design and the existing template of Disneyland were spot-on, and covered material that was unexpected. Thanks for making this available. I look forward to reading the book that Tony Baxter says he is working on about his years with Disney Imagineering. November 7, 2013 at 10:11 AM · Tony is a fabulous designer and great to work with. It is a sad day for Disney that he is retiring! He made many uniques contributions to Disney parks! November 12, 2013 at 1:17 AM · A great piece. I can hear Tony's voice in my head while reading - looking forward to the continuing conversation.